Elyxr Air review | What Hi-Fi? Less visible tech about your person once meant a less geeky look. But the opposite is true of the wire-free Apple AirPods – wear these and you instantly mark yourself as a certain type of techy person – and not the type everyone wants to be. The Elyxr Airs are the same kind of zero-wire earphones as the AirPods, but they are far more discrete. And they’re cheaper, too. Rather than dropping little plastic stems out of your ears like the world’s tiniest Bluetooth earpiece, the Elyxr Air look just like normal IEM earphones with their cables snipped off. Virtually no extra bulk is needed for the wireless electronics and battery, which is pretty impressive. 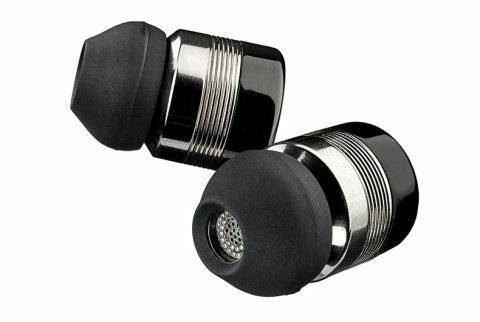 The most common question raised with earphones like these is, do they fall out of your ears? While the Elyxr Airs are slightly heavier than a normal pair of earphones, they don’t fall out once during our time testing them. Like other IEMs, they rely on silicone rubber tips that dig into your ear canals to stay in place. There are three different sizes of tip in the box. Pick the right one and you should have no issues. Elyxr has escaped the embarrassment or show-off factor of this newer kind of earphone, but the battery life problem common in this category is still here. They last for just three hours off a charge, where pairs with a cable running between the buds tend to reach around 8-12 hours. That’s no good if you need your headphones to last all day, but the Airs do have a rather neat charger. They come with a 2100mAh external battery pack that looks like a fancy vape pen with the top chopped off. There are two little holes for the earpieces, into which the earphones lock magnetically to start charging. It also has a USB socket to let it charge other devices, and the whole thing is petite enough to comfortably fit in a trouser or jacket pocket. It’s effectively a case, too, as the aluminium outer shell can be pulled up to cover the earpieces. This is a neat design, plus the power bank provides up to 12 charges, and there are three colours to choose from: black, pink and dark grey. Performance in-use isn’t quite as impressive, though. Wireless stability is distinctly less than perfect, with regular moments where the audio drops out of both earpieces. There’s none of the odd digital garble of some other wireless earphones as they lose signal, it’s much more like someone quickly flicking the volume fader down at the first sign of trouble. But it happens too often not to spoil your enjoyment to a significant extent. Sync issues between the earpieces also make sound quality variable. They don’t have the rock-solid synchronisation of the AirPods. While this doesn’t introduce appreciable lag between the earpieces, if the two haven’t attained a perfect sync it sounds as though there’s something odd going on in the central channel. Like a phase issue with normal speakers, it’s clear all is not right. Let them bed in and learn to put up with the cut-outs and you end up with a pair of earphones that sound a little like a fuller but more congested version of the SoundMagic E10. It’s a populist sound, with some extra weight in the bass and a focus on making music sound warm and thick rather than by emphasising treble detail. However, there are several issues that gnaw away. For earphones that don’t have a particularly detail-oriented sound, they show up the lower-quality wireless sound transmission in the upper mids and treble. The edges of hi-hats and some vocals take on an unpleasant, ragged digital edge. It’s as though some crucial part of the sound processing has been missed. This leaves any songs that bring out these shortcomings sounding a little crude. It’s a shame, because when they’re firing on all cylinders the Elyxr Air's tonal sins are not too bad. A degree of bass and mid-range resonance reduces the perceived space in a mix, but there’s enough power and scope to the sound to make them enjoyable. The Elyxr Airs are an alternative to the Apple AirPods, but they're hampered by a number of serious issues. Poor wireless reliability and sound made crude by the all-too-obvious effects of ugly digital noise compound the stamina issue. They’re better for showing off to friends than using day-to-day.